Synopsis: A Colonel handles the complex exchange of a prisoner swap in post-WWII Berlin. Special Features: Interview Featurette with Tony, Carey, and Cecelia Peck (8:48) / Theatrical Trailers. After years as an experienced writer-producer at Twentieth Century-Fox, screenwriter Nunnally Johnson made his first film as director with this virginal Cold War espionage thriller set in postwar Berlin. Jed Harris and Tom Reed’s story was critically well-received and nominated for an Oscar, but it’s not the explosive, intense suspense-drama sold by Fox’s teasing ad campaign. Ostensibly a kidnap story, the film’s inaugural snatching of an American soldier from Berlin’s American Sector into the Russian Sector launches two story threads: the boy’s industrialist father Charles Leatherby (Broderick Crawford) who personally flies to Berlin and initially bullies the U.S. Army to Try Harder, even suggesting bribing the crooks to get his boy back; and savvy, wry Colonel Steve Van Dyke (Gregory Peck), forced to broker the prisoner swap using two pre-WWII double-agents wanted by the Soviets. Crawford plays a classic ugly American, talking loud, boasting of his business acumen, ignoring the finesse of diplomacy, and willing to smash already fragile relations with an oppressive regime to forward his own agenda – a character who strangely resonates in present day Trump America. Eventually father and Colonel meet in a neatly performed scene in which pissed off Van Dyke quashes Leatherby’s bluster ansd puts him in his place as a fish completely out of water. We expect Leatherby to stomp into Van Dyke’s office and trash him for napping on the job, but the Colonel makes it clear the men Leatherby’s steamrolled in a hotel lobby the day before are on his side. Van Dyke throws Leatherby’s words and preposterous ideas back in his face without invective or getting personal; he just makes it clear Leatherby’s experience in deal-making and manufacturing axle grease in Detroit offers nothing to the fragile relationship among Allied troops in occupied Berlin, and the Soviets, who’ve recruited former Nazi spies and sadists to kidnap gullible soldiers in exchange for prior enemies of the state in need of being permanently silenced. Rita Gam plays the Hawksian role of hot secretary Ricky Cates who’s just as cynical as Van Dyke, but as two scenes make very clear, maintains a fine border line between working at the office, and a enjoying relationship with her boss which colleagues know, and keep mum. The Colonel’s assistant, Sergeant Eddie McColloch (Buddy Ebsen), is his sidekick, and admittedly Ebsen’s only moments of character development involve checking baseball highlights when the aging double-agents are brought to the U.S. Military Hospital after attempting suicide by poison, and getting lost in the paternoster elevators in the I.G. Farben Building, which in 1954 was used as a central military headquarters of the Supreme Allied Command. The hospital doctor (Walter Abel) trying to save the lives of the self-poisoned, double agents also adds a less successful running gag to the film by repeatedly bumming cigarettes from characters (and smoking in hospital quarters) before a punchline in the finale’s wrap-up. Van Dyke does have a former flame in one Ms. Hoffmeir, a blonde lass he brands with the name “Hoffy” (played by Swedish import Anita Bjork) whom he uses to ferry info between East and West officials, and later to handle the spy exchange when Hoffy coordinates the delivery of the missing soldier at the hospital. In the Blu-ray’s featurette with Peck’s children Tony, Carey, and Cecelia, there’s an admission the actor had trouble keeping track of the plot twists that become heavily convoluted, but Johnson’s film is an interesting experiment with genre conventions by focusing on the back & forth maneuvers as Van Dyke keeps Leatherby around to witness the cruelty of snatching the double-agents from their ignominious yet secure states in the American Sector, seeing them near death after they take strychnine to avoid capture, and be reduced to disposable bargaining chips for a what van Dyke brands as a mob-style deal. 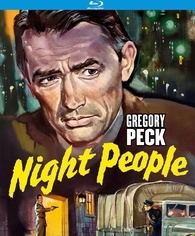 Night People was shot in post-WWII Berlin after much of the rubble had been cleared and the city was undergoing a major restoration, but exterior locations are fairly sparse; Carol Reed milked the city’s ruins more vivdly in The Man Between (1953), another star-studded postwar suspense in which the relative of an Allied officer disappears in the Soviet sector. The few striking exteriors include Crawford wandering onto a terrace at an apparently long-gone hotel that overlooked the bombed out Kaiser Wilhelm Cathedral. Seen below the spire, the ruined edifice is nevertheless impressive for its obvious size, and the brief scene has the camera panning with Crawford’s movements, allowing for a view of the huge intersection with boarded up, bombed out buildings on the side, as well as a streetcar line that turned in front of the cathedral – a line no longer extant. There’s also a ground-level terrace where the Colonel meets Hoffy, and a splendid view of a lake with an island nestled in between; and footage of a streamlined plane slowly pulling into the covered area of Tempelhof Airport, where Crawford steps out. Aside from some post-credit footage of U.S. tanks and troops marching down a Berlin thoroughfare and brief views of the I.G. Farben Building (as well as some scenes shot inside, including the unique paternoster elevator system), everything else takes place indoors. The hospital exterior and the Soviet ambulance vehicle passing through Checkpoint Charlie feel real, but they’re shot at night, masking evidence of peripheral Berlin details, and knocking down the film’s production value to that of a standard Hollywood back lot. Kino’s Blu sports a crisp transfer taken from a gorgeous print, but there are some slight issues in Fox’s mastering: compression is evident in the dark black corners of starkly lit scenes, and after scenes fade to black, there’s fine lines which disappear as soon as the next scene fades in. Colours are lovely, and the lighting by cinematographer Charles G. Clarke (Violent Saturday, The Sound and the Fury) is gorgeous, featuring warm amber for faces, and pastel tones for the night scenes. Although Fox’s trailer teased the film with painted stills from the film to hint at the widescreen, stereophonic magic that was to come, Night People could’ve been shot 1.33:1, as there’s minor benefit to the wide format. Clarke’s lighting and compositions are fine, but perhaps due to Johnson’s first go as director, he wasn’t as concerned about striking visuals. The movie’s about characters tackling moral conflicts and necessary change – even Van Dyke breaks from protocol when he clocks Hoffy in a shocking moment replicated in the poster art – and stuck with the early CinemaScope lenses, there’s severe bending at the frame edges, especially on the left, stretching seated figures and smooshing their heads. Worse are fast pans, where all the edge info transitions from smooshed to normal as they pass through the centre frame where the main characters remain fixed. Street crossings are especially severe, and it’s hard to keep focus on the central characters when the edge material is so distorted, and yet the best way to deal with the technical shortcomings is to respect the film as a partial artifact of emerging cinema technology: Fox clearly knew what was wrong, but the need to beat 3D with the ‘glasses-free’ CinemaScope format was necessary to the studio’s survival as free TV had already started to keep cinemagoers home. Subsequent productions used newer Bausch & Lomb lenses. Cyril Mockridge’s score consists of march music that bookends the film, as well as the bombastic credit music. With the exception of a burlesque song performed by a vaudeville troupe in a Berlin tavern, the lack of a music score may reflect Johnson’s aim for a docu-drama feel that generally works. Although shot in Germany, the focus on Allied American soldiers minimizes the inclusion of German actors. Charismatic Peter van Eyck (The Wages of Fear) is a ‘diplomatic informant’ with Soviet connections, and Van Dyke’s former flame Hoffy is played by Swedish actress Bjork, who doesn’t have that much to work with. Her character’s the classic duplicitous German who tricks Allies, a cliché present in Carol Reed’s otherwise clumsy Man Between where secretive Hildegard Knef allows her British husband’s sister to be courted by an East Sector mob man; and George Seaton’s The Big Lift (1950), where German women, like Knef’s character, are seen as liars who survive by extracting comfort, supplies, and wealth from Allied innocents, or naïve dopes, depending on one’s view. For Bjork, who’d achieved acclaim in Alf Sjöberg’s Miss Julie /Fröken Julie (1951), her moment in Hollywood was fleeting, and after this one-timer returned to Sweden to enjoy a steady career. Peck appeared in a quartet of films scripted by Johnson, including The Keys to the Kingdom (1944), The Gunslinger (1950), Night People (1954), and The Man in the Grey Flannel Suit (1956). Johnson’s directorial efforts include Night People (1954), Black Widow (1954), How to Be Very, Very Popular (1955), The Man in the Gray Flannel Suit (1956), Oh, Men! Oh, Women! (1957), The Three Faces of Eve (1957), The Man Who Understood Women (1959), and The Angel Wore Red (1960).